This gallery contains examples of some of the items I make using timber from all over the place, local, imports, natives, weeds or otherwise. Clicking on a picture will display it in a viewer where you can move to the next or previous picture by moving your mouse to the left or right half of the picture and clicking the button that appears. Wrap-dispenser from Jacaranda and Sally Wattle. Bath-set from Poinciana with Norfolk Island Hibiscus and Sally Wattle trim. Segmented vase (1st & last!) in Northern Silky Oak and Silver Ash for our club challenge. Bowls turned from Mango just a few weeks apart shows how quick the mould progresses. Bowl in Silvertop ash burl. Candelabra from Rose mahogany and Gidgee. Candelabra from New Guinea red cedar. Set of six goblets in various timbers. Jewellery box from Hoop pine, Red Cedar, Hairy oak, Camphor Laurel and Poplar. Lidded box in Black bean and Camphor Laurel. 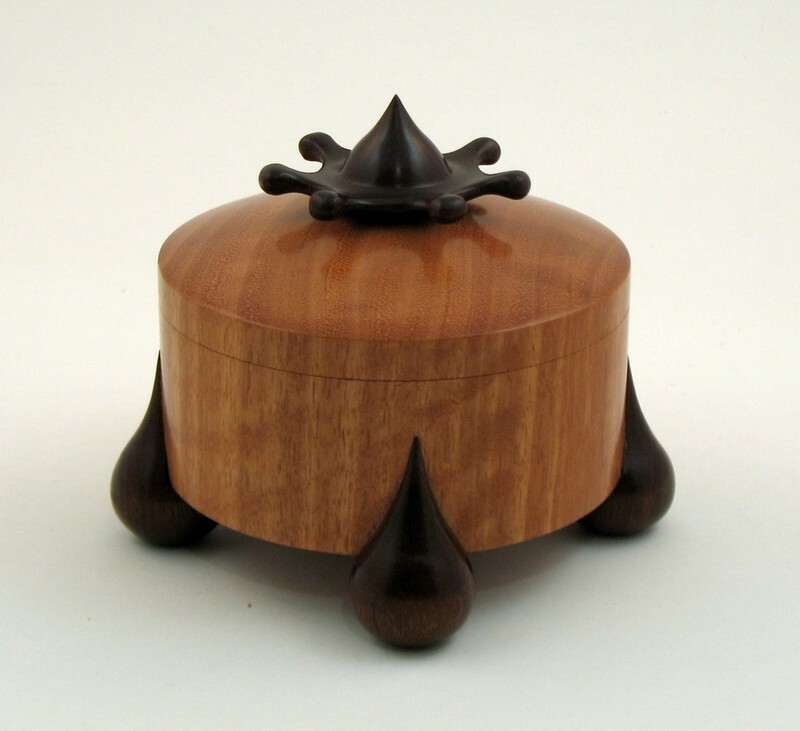 Lidded box in Rose mahogany and Norfolk Island Hibiscus. Lidded box in Tamanu (callophyllum inophyllum). Lidded box in Tamarisk (AKA Athel pine). Pens/pencils in Gidgee, Mulga, Ooline, 2 x Purple Gidgee, 2 x Lignum Vitae. Picture frame/box in Cypress pine and Sally Wattle. Pomander in Ash and ebonised Mulberry. Remote control caddy from Black bean and Ash. Dunny-roll holder from Coastal Banksia. Spinning top in Emu Apple and Paperbark (top). Vessel in Sally Wattle and Ash. Wrap-dispenser from Rose mahogany and Bumble. Business card holders in a variety of timbers. Offset, fluted bowl in Sycamore. A collaboration with the Inland Northwest Woodturners of the USA. Salt and Pepper shakers in various timbers. ...for my Grandaughters pet lorikeet "Rosie"
'Merging ball' box from Pennyleaf. A twist on Guilio Marcolongo's 'Emerging ball'. More 'Sensory' boxes from Sandalwood, Coachwood, Rose Mahogany, Myall and Guttapercha (my absolute favourite aromatic timber). 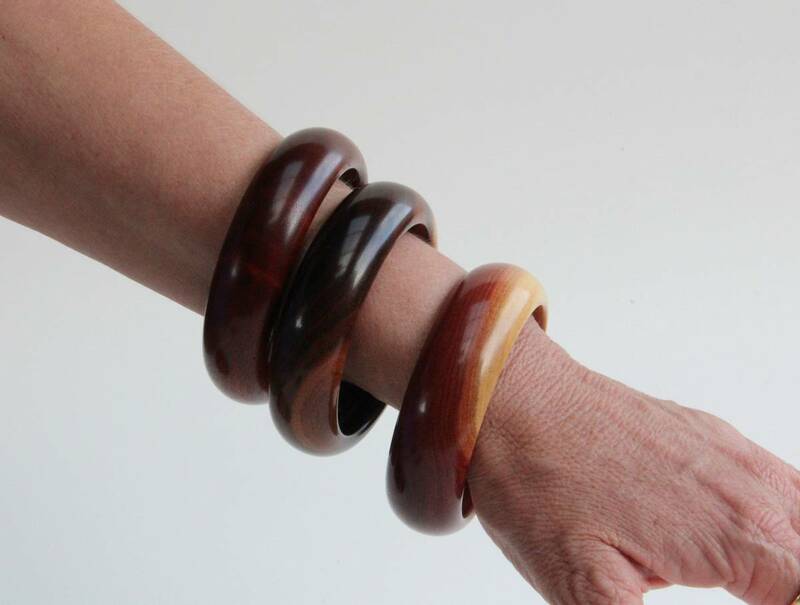 Bangles - Burdekin Plum, Desert Oak and Dead-Finish. 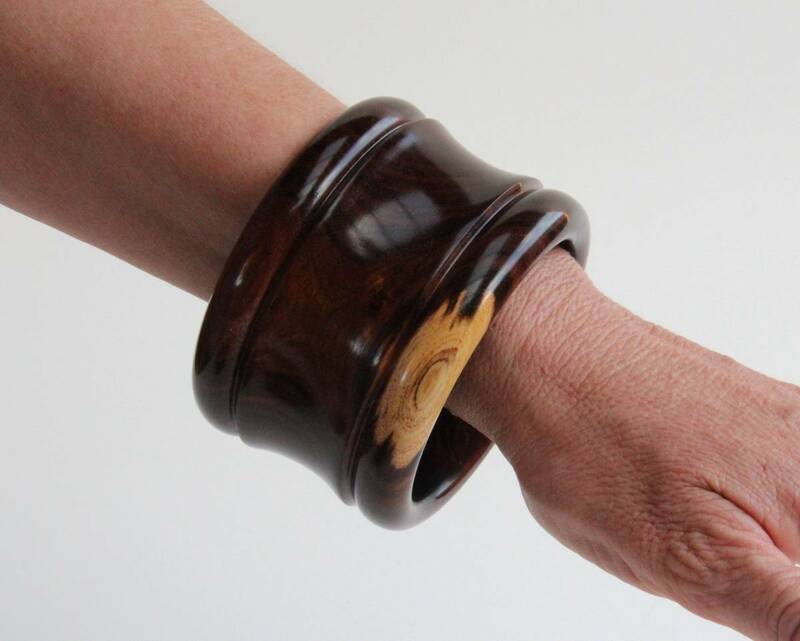 Bangle in Desert Oak - a special request by my newest Daughter-in-law to wear for the wedding.